So I accidentally bought a radio on ebay. 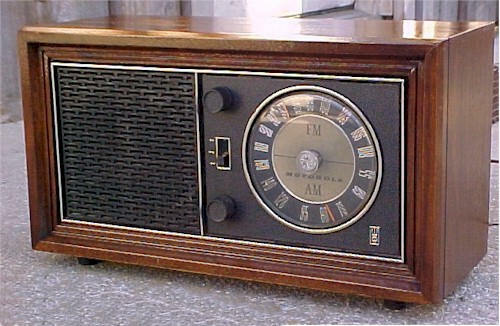 I was looking for a radio that we had when I was a kid and thought that this one was it (as best I could remember). Anyways... there was an option to "make offer" I never did that before on ebay and figured it would either not accept it or would take a day. So I offered $15, it instantly came back and said offer accepted pay now! Whoa, wait a minute! Then I looked at the shipping and that would be about $30 THIRTY DOLLARS! Sigh. And the bulb did not light (which is good). The radio worked (both AM and FM) even though the auction said the FM did not (bonus). The case is in really good condition and may only need some polishing. The knobs are worn but not enough to replace them. Replace all the paper capacitors (3). Replace the potted electrolytic 3 section capacitor (or re-stuff it). Replace the Selenium Rectifier with a silicon Rectifier (and attending passives). Fix the radio so that it cannot be plugged in (easily) with a hot chassis when the radio is off. And anything else I can think of that will keep the radio from accidentally killing someone. When I opened the radio it was only slightly dusty inside, especially for a radio that is around 60 years old. As far as I could tell it was all original, or if any repairs were done, they had been done with factory parts. The one scary thing I noted was that some of the metal parts were covered with a yellow dust. I did not know what this was and this made me a bit leary of it. I avoided touching it and cleaned it with denatured alcohol after blowing the chassis off outside. Later on I googled "yellow powder vintage radio" and found out that it is cadmium sulphide. YIKES! seems some of the parts are cadmium plated. So I cleaned it some more with vinegar (neutralizes the CS and removes it) and denatured alcohol until most of it was gone. Then wiped down my bench and thoroughly washed my hands. The selenium "Kill you in your sleep" rectifier. One of the paper "burst in to flames" capacitors. The front of the chassis with some of the Cadmium "give you cancer" sulphide. The underside of the "one slip and you're electrocuted" chassis. 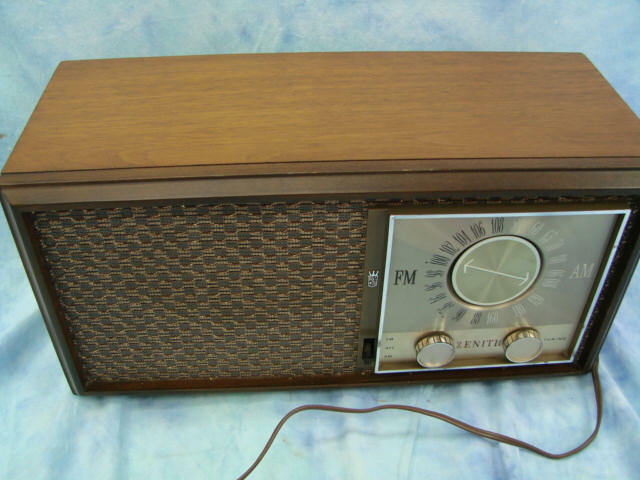 So why am I refurbishing a "working radio"? Because it's a death trap. I am going to make it a slightly less "deathy" death trap. because I have never done it before, and because I can. added quick disconnects for the AM antenna and the FM antenna lugs, so you don't have to un-solder them to open the back of the radio. Opened the 3 section capacitor (smelled like band-aids), cleaned it out and prepped it to possibly receive the modern caps I ordered (if they will fit), otherwise they are going under the chassis. picked up the 1n4007 diode.